Over the 2019 NCAA season, every all-new INFINITI QX50 test drive raised money for INFINITI’s pet charity: Coaches vs. Cancer. So even legendary coaches like UNC’s Roy Williams were a little too into it. And he even brought a special friend. Role: CD/CW Agency: CPB. 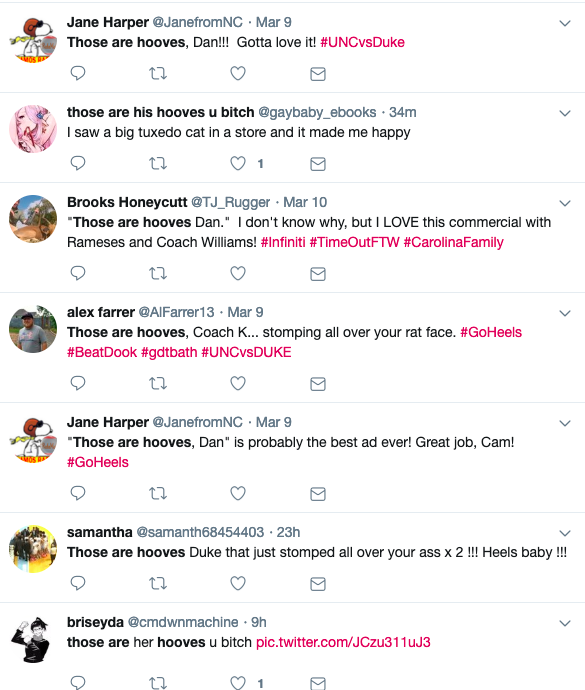 And as it picked up social traction, the “hooves” line started to become a meme for “you dumbass” & a rellying cry for UNC Tar Heel fans.As it picked up social traction, the “hooves” line started to become a meme for “you dumbass” & a rellying cry for UNC Tar Heel fans. And it was a no-brainer for extra social content. Hall of Fame coach and Hall of Fame dork.